Use Coupon Code WHMAG15 for 15% Discount! Livliga has a lot to celebrate! This past week WomensHealthMag.com featured my husband and me in an article about our weight loss journey and how it led to the creation of Livliga. This journey was made possible because of a lot of support and because of the amazing country we live in. We are excited to share our story with you! 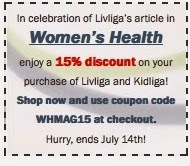 And in celebration of the 4th of July and our article highlighting our version of the American Dream, we want to celebrate with you by offering a discount on Livliga and Kidliga product!